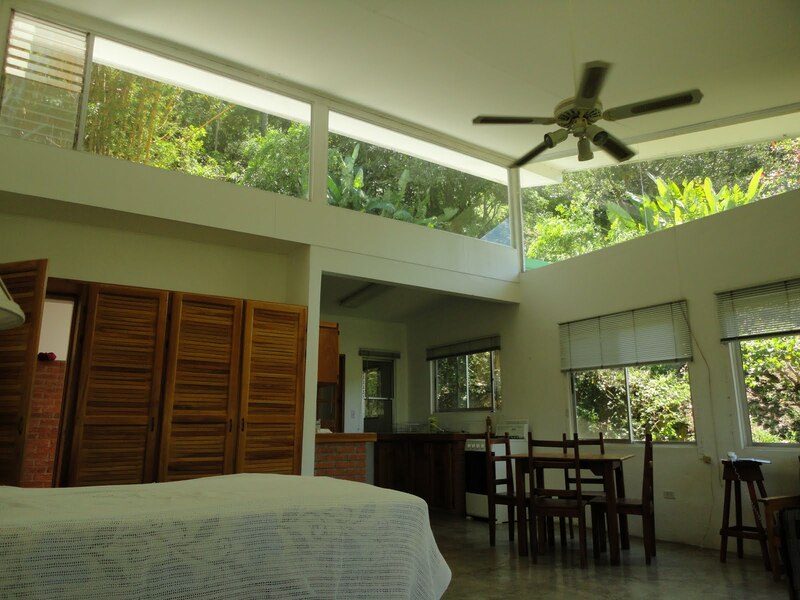 Mission: The Julia and David White Artists’ Colony is a private retreat located in the midst of a private 17 acre rainforest in Ciudad Colon, Costa Rica, a 35 minute drive from the capital, San Jose. The Colony was established in 1998 by Dr. White as a memorial to his children, both of whom died tragically as young adults. Julia was an astrophysicist and accomplished poet and playwright; David a highly talented composer and woodwind player. The Julia and David White Artists’ Colony is devoted to promoting the arts so dearly loved by Dr. White and his children. Ciudad Colón is located twenty three kms from the capital city San José. It is situated in the province of San José, in the county of Mora. The weather in Ciudad Colón varies between the dry and green seasons. Average temperature year round is 22-24 C. It sits at an altitude of 840 meters above sea level. Costa Rica banned capital punishment in 1877. It abolished its military in 1948 and has since relied exclusively on dialogue and diplomacy in conducting its international relations – a model Dr. White supported for all Nations. The Colony wants to give artists – today’s visionaries and innovators – the opportunity to explore their creativity in the peace-loving culture of Costa Rica. Colony housing includes two painters’ studios with 20-foot ceilings, two writers’ studios and three cottages for either composers, writers or visual artists, all in natural wooded settings. In addition, the former communal building “The Nine Muses” has also been converted into a studio. Cost: 14 days or less $575 per artist, or $850 for two artists sharing one space; Up to 29 days $800 per artist, or $975 per two artists sharing one space. 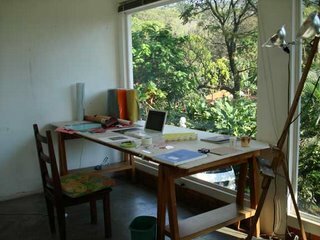 Accommodations: The Colony provides each artist with a private studio on a beautiful 17-acre hillside setting. A swimming pool, and hiking paths are provided for recreation. Basic necessities and a Saturday Farmer’s Market are available within walking distance in the local village, Ciudad Colón, population 10,000, elevation 3,000 ft. (900mts). A shopping mall and cinema complex are a 20-minute drive from The Colony. Bus and taxi service to all of Costa Rica is available from Ciudad Colón. From scenic walking paths one can see the Pacific Ocean as well as volcanoes across the Central Valley. There is a small library room between the two writer studios, with a computer and Internet, and a comfortable armchair. Benefits: At events organized by The Colony, works of resident composers, visual artists and writers are exhibited and performed. Posted in Costa Rica, The Julia and David White Artists ColonyTagged art residency, Artist Residency, arts, bus, Caribbean, central valley, cinema, Ciudad Colón, composer, composers, computer, Costa Rica, Dr. White, events, Exhibition, farmer's market, forest, hiking paths, hillside, internet, Library, Literature, local village, memorial, Mora, no application deadline, no application fee, ongoing deadline, Pacific Ocean, Painting, painting studio, Performance, playwright, poet, private, rainforest, recreation, retreat, San Jose, shopping mall, Studio, swimming pool, taxi, The Julia and David White Artists Colony, The Nine Muses, visual artists, Visual Arts, volcanoes, walking paths, woods, woodwind player, writer, writer studios, WritersBookmark the permalink.